Just now, I was taping up a box of books and spotted my copy of A River Runs Through It. It’s one of my favorite books, and I read it for the first time (the whole thing in one sitting, on a wicker sofa on a screened-in porch on Nantucket) in September 1992. The movie came out the following month. When I pulled the book from the box and opened the front cover, a folded piece of paper fell into my lap. What was typed on the half-sheet (yes, typed – on a typewriter, kiddos) was something I had forgotten and hadn’t laid eyes on in years, a bit of prose that I wrote around the same time as I read that book. Or maybe a few months later, the first time I moved away from Connecticut (which, among the places I’ve lived, is still my favorite). Even as I itched to edit the passage, it let me look, through a telescope of words, as far back as 17 years. You might remember my mention of an atlas that I’ve kept for years, all marked up and dog-eared, stained with coffee and memory. Well, before that one, there was another. She started to throw her atlas into her bag along with the other books she’d taken along on her trip, then stopped. She ran her fingers over its faded and worn cover, then let it fall open. She stared at the map of Connecticut for a long time, minutes. The names of towns were circled, certain routes were highlighted, directions were scrawled into the margins. and as she stared, the pages became something, something created by her, a story only she could tell. The dots for the towns became churches and houses and shops. The blue lines and lakes became drives to the reservoir and dives off the rocks into the river. The shore became waves and moonlight and storms and children laughing on the swingsets. And the lines became journeys to a thousand different places on a thousand different days. And all of these became journeys to places inside her, some which had no end or destination, and it suddenly became a picture. No, many pictures. Each with its own story, its own beginning, its own lesson. The pictures became a lifetime, and this lifetime was hers. Okay, so it’s just a silly bit of writing, and I don’t remember why I tucked the paper inside the book, but when I read it again, it felt as much like a snapshot as anything. Of what I knew I would miss, or did already. Of what places and roads meant to me. Big surprise, right? I was glad to find the book, too. A couple of days ago, I talked Hunter into watching the movie (didn’t take that much convincing). He loves to fish, and liked the movie as much as I thought he would. And he wants to learn to fly fish (me, too). As for that piece of paper, I left it where I found it, next to words that, so many years ago, left a mark on my soul. Like a river, yes, or maybe a road. Of course, now I am too old to be much of a fisherman, and now of course I usually fish the big waters alone, although some friends think I shouldn’t. 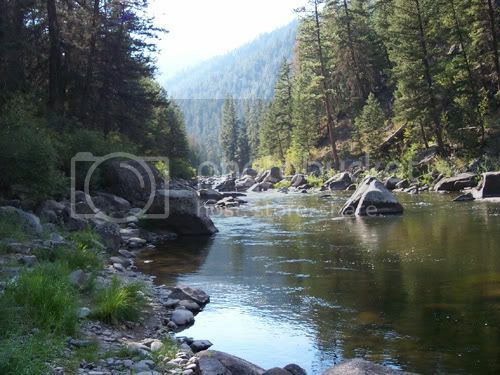 Like many fly fishermen in western Montana where the summer days are almost Arctic in length, I often do not start fishing until the cool of the evening. Then in the Arctic half-light of the canyon, all existence fades to a being with my soul and memories and the sounds of the Big Blackfoot River and a four-count rhythm and the hope that a fish will rise. I can’t remember if I read that book, but now I have to. I vividly remember the movie. I’m glad you saved your paragraph. You take me back to my first reading of this book. Loved it then. Love it now. I might need to re-read it. I love finding little pieces of my history like that. Inside of you and pointing true north, there’s an old dirt road running through your soul. It’s amazing to me to see such… YOUness in writing from that long ago. I think if I had just read that somewhere, I would have thought… wow, that sounds like Jennifer! 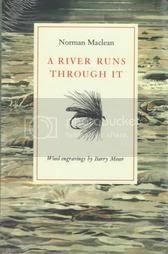 And I don’t have words to express how much I needed those words from Norman MacLean right now… love, love, love the book, love the movie. It is wonderful to discover these old writing gems. It really is an intriguing piece, most especially because it talks of roads and places – and hints of the great writer to come. That is definitely a piece of you captured on paper. That is my all-time favorite book ever. I read it in 1983 in a college lit class, and as the English major daughter of a Scottish fly-fishing preacher in Oregon (I even had a wild little brother), how could I not love every word. Thanks for bringing it back–I think I need to pull it out again. Our writing is a mirror to our souls, Jennifer. Maybe that piece of paper will inspire you to even greater heights. I’ll be at your book signing – really! I have that book tucked away on a shelf somewhere. A friend gave it to me when she finished reading it–now you have me itching to take it out & read it myself. I love those moments that bring you back in time for a little while. Whether they were good or bad times, I find that it’s always nice to revel a bit and see how far you’ve come from that place in time. I had a “River Runs Through It’ on video for the longest time. My version wasn’t close captioned so I gave it to my daughter when I went deaf. Reading this reminded me how profound I always found the movie. I think I’m going to look up the book as well as the DVD version…This will always be timeless to me. Thanks for the reminder. it’s not a ‘silly bit of writing’. So there. wow. I never read that book, but now I will. Just that little bit of prose and down down I go into the dream of the text. I admire the ability of a writer who can some how channel words and sentences like that into a river in my mind with a current of its own. And I have to agree with Queenie who says it’s not a ‘silly bit of writing.” If we all let ourselves go there nothing would be written! What you wrote rings true to me. I can see it. Frankly, I like yours better. Here’s a piece of lit crit analysis for you: yours is specific, full of the moments of life–as is most women’s writing. His is grand and general and –well, nothing that speaks to me of a person. These thoughts came to me along with all the stuff and such that I studied doing my PhD coursework. Men have reified their own grandiose writing over the years so that their abstractions are great literature and our concreteness is considered a sign of second rate. This is beautiful! I loved the movie and these words speak to me today. Thank you for sharing this! your writing is not silly, to say the least. Please, I hope you know how much I love what you have to say. I honestly, don’t have that capacity and I’m envious. i can’t remember if i read the book or not. i think i did. let’s just say i did. man, i loved that book! one of my favorites! i will never forget it? no, really,l i think i did and of course the movie was incredible. i think this summer would be a good time for me to redo both of them. That is such a beautiful piece of writing (yours and his). I want to see you published and I want to go to Montana. Finding old bits of writing is SUCH fun. I loved that film, too–am hazy on what I thought of the book, though. Weird, eh? I was all about Brat Pitt when that movie came out. I love what you have written. A bit of romantic yearning for adventure. You definately have the writer’s touch. I loved this the first time I read it and glad to see you made David’s POTD. Oh how I wish I could miraculously turn up some of my teenage writing. How lovely that you found your writing. Talent … such talent … really .. and congrats on the POTD! That’s always such a moving, bittersweet moment, to find your thoughts from the past. I also think it’s so interesting how the themes of the woman you are now – roads and where they lead – started as seeds back then. Really cool. How lovely! You are a truly great writer! I don’t think your writing is silly in that passage at all. I think it’s lovely. When were we headed to Montana again? I don’t think that was silly writing! I wanted it to go on and on – what happens next? I have a personal penchant for rivers. I love most any kind of body of water, but rivers, a couple in particular, speak to my very soul. These little snapshots of writing are priceless! I occasionally dig out an old journal and read some of the stuff I wrote way-back-when. Love this. It reminds me of the things you told me when I visited. About the things you saw and did while you lived there. And I didn’t comment on the moving post below, but I’m sick about the other family. Maybe they are moving to hide because too many people have noticed them. It’s scary. It’s more than scary.